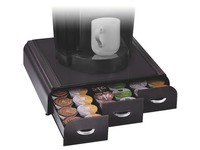 Ideal for organizing your capsules. You can put this drawer under your espresso machine for saving space. The drawer is provided with 4 dividers, in order to arrange and sort out your consumables. Handle in chromed finish. Shock resistant polystyrene. Dimensions: H 6 x W 23,4 x D 40,5 cm.